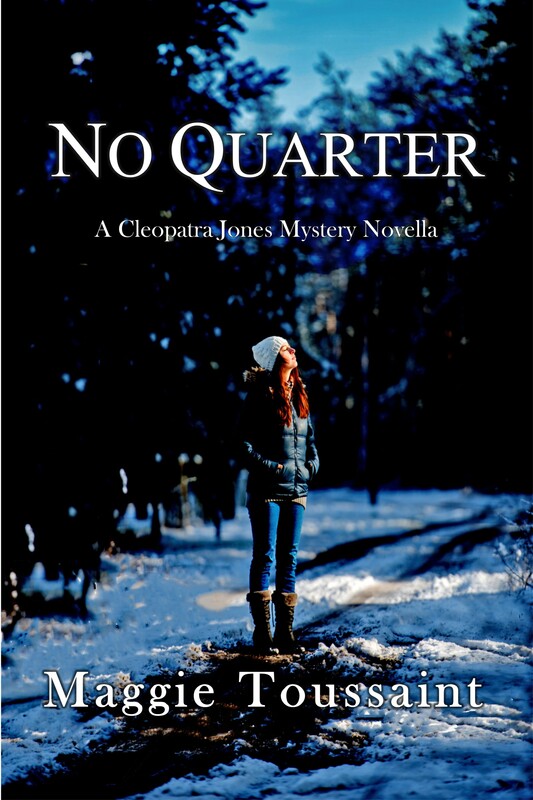 No Quarter, A Cleopatra Jones Novella by Maggie Toussaint–Amnesia, the doctor says when accountant Cleopatra Jones wakes in a distant hospital. Hours later most of her memory returns. Detective Jack Martinez visits Cleo’s nearby wealthy client, only she’s dead and broke. To Cleo’s horror, she’s a murder suspect. Will she totally recover her memory before the killer returns? 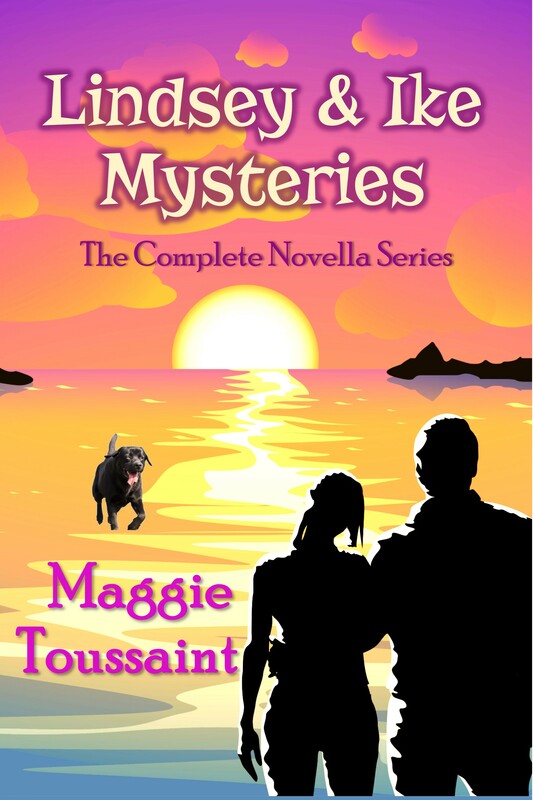 “No Quarter by Maggie Toussaint is part of the Cleopatra Jones Mystery series, a new-to-me series. I love Maggie’s Dreamwalker series, though, so I suspected this novella would appeal to me. I was right! And it can definitely be read as a standalone. Since the novella begins with Cleo having amnesia, as she re-learns people’s names and other facts, the new reader learns about Cleo too. I delighted in getting to know Cleo in No Quarter. Cleo’s transitions — from an amnesiac Jane Doe, to a person-of-interest in a murder, to a person-of-interest of another sort — make the novella fun and interesting. I like how the detective accepts the sleuthing insights that Cleo has, instead of discounting them as you find in some cozies. There’s an exciting action scene, where Cleo saves the day. She is integral in solving the big case, also. I look forward to reading all about Cleo in her earlier adventures. I thoroughly enjoyed No Quarter, and recommend it to all fans of cozy mysteries. I think it will have special appeal to fans of the rest of the Cleopatra Jones Mysteries, to fans of Maggie Toussaint’s other books, and to accountants everywhere. “Ma’am? Are you all right? The voice sounded a million miles away. I barely caught the words. Didn’t matter though. I was too woozy to answer. Go away. Let me sleep. Fingers pried an eyelid open, and a light blinded me. Startled, I tried to rear back, only there was nowhere for my head to retreat. The light winked out, then it blazed into my other eye. Leave me alone. I tried to curl into a fetal position, only my arms and legs didn’t move. I was paralyzed! Icy fear shot through my bloodstream. I was in danger. Had to hide. Had to sleep. Painful tingles lanced my hands and feet. I groaned inwardly at the awful sensations. Why wouldn’t they leave me be? I felt like a slab of meat with people standing around and poking me. “She’s coming round,” the voice said. “Ma’am, can you hear me?” a deeper voice asked. “Yes,” I said, only my lips didn’t move. Cold. I was so cold. I shivered and trembled. “She’s going into shock,” the voice said. Joints ached. Head pounded. I squinted through slits of eyelids. White ceiling. White room. Where am I? What happened to me? My fingers curled, nails dug into my palms. I tried to lift my head, and pain sliced through me. Beeps sounded. Footsteps approached. My eyes opened wide with terror. A woman dressed in white beamed at me as if I’d won a prize. “There you are.” She punched a few buttons, and the noise ceased. The throbbing in my head lessened. Car accident? No way. I’m a safe driver. I tried to tell her, but my words came out gibberish. My pulse thrummed in my ears. Vital signs. I’m alive. That was good news. A cuff squeezed my arm, sending my heart rate into a gallop. A tree farm? This was all so confusing. What happened to me? I tried to remember, but static filled the void where my memory should be. “The charge nurse said you were awake,” a man said. I opened my eyes, tried to speak, and got gibberish again. So frustrating. I blinked twice at the tall man in the white coat, and he smiled. An injury? I had no memory of an accident or injury. Then I rewound more of what he’d said. Oh. Memory loss. The mental fog made sense now. Regardless, I wanted out of here. I wanted to go home. I blinked twice and waited. Home. Where was home? My name. Somebody asked me my name earlier. It’s . . . what is it? I couldn’t remember. I blinked twice. Photo to the cops. Good. My family would find me. Wait. What was that about a bump on my head? I blinked three times in a row. He jotted notes on a chart, ignoring me. I tried to sit, but my stiffened joints protested. Sit tight. As if I could leave. I flexed my fingers again and then I tried my toes. They didn’t respond. Not good. I wanted to lift my head and see if they were still attached to my feet, but that would trigger alarms again, which would make my headache pound harder. With each passing moment, mental clarity strengthened. I tried to piece the facts together. Something happened to me, and I was in a hospital. It was January, and I’d been walking through a tree farm. The farmer hadn’t recognized me, the cops didn’t know me, so I must not be local. Why was I walking around someplace I didn’t belong in the middle of winter? I thought and thought until I gave up. Somebody must be searching for me. Somebody would come for me. My eyes drifted shut again.